Not sure how to check in and take advantage of these discounts and deals in Yelp? Don't worry, we've got you covered. Follow along below to see how to find discounts and deals, check-in, save check-in deals to your account, and redeem your offers in-store — all from your iPhone or Android phone. 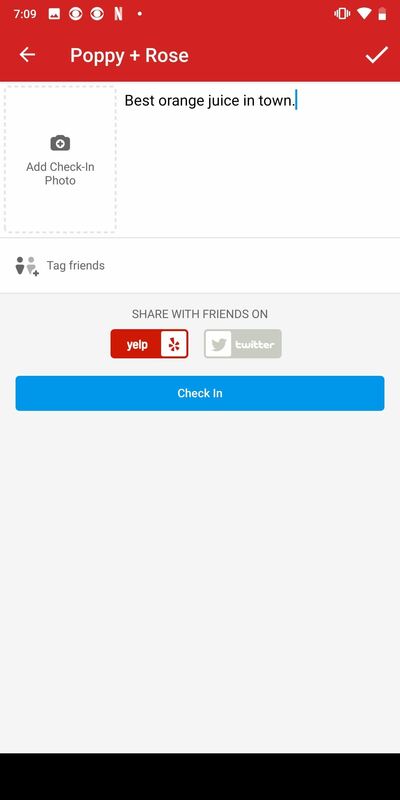 There is no section in the Yelp app devoted to showing you businesses in your area that currently have check-in offers. There is a "Deals & Offers" section in Yelp, but that's primarily for Yelp deals and certificates, which is similar to Groupon. But that doesn't mean there isn't an easy way to find them. From the "Search" tab, simply search for "Check-in Offers" for your current location or any other location you manually switch to. After you activate the search, you'll see all of the nearby restaurants, cafes, bars, mechanics, shops, salons, breweries, and anything else you can think of that currently have check-in offers available. 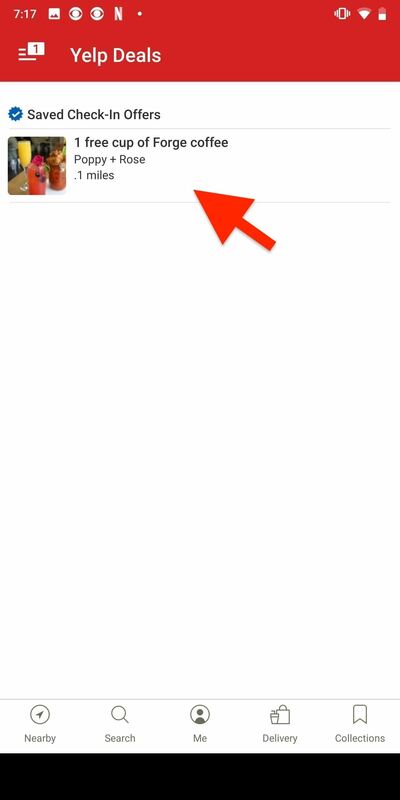 Alternatively, you can tap either "Nearby" (Android) or "Search" in the navigation bar at the bottom, then "More" in the list of categories. From there, select "Check-In Offers." It's basically the same as the previous method, but you'll have to change your location after the fact instead of at the same time. You can also check each business one by one. Either way, tap on the listing and scroll down to right underneath the map and address. If there is a check mark symbol in the Info section, the business has a check-in offer, which is explained right beside it. Typically, you'll see a percentage off a purchase, a discounted price, or free item (e.g., a sticker, drink, limited warranty, etc.). Now that you've found a business offering a check-in deal or discount, it's time to redeem it. To do this, you must check in. You can do this one of two ways: First, you can use the "Check-In" button near the top of the listing. Second, you can tap on the offer that appears next to the check mark. On the Check In page, everything is optional but preferred if you're looking to keep your account looking professional. Jot down something simple, add a photo if you want, tag any friends you're with if they don't mind, select whether or not to share with friends on Yelp or Twitter, then hit "Check In." 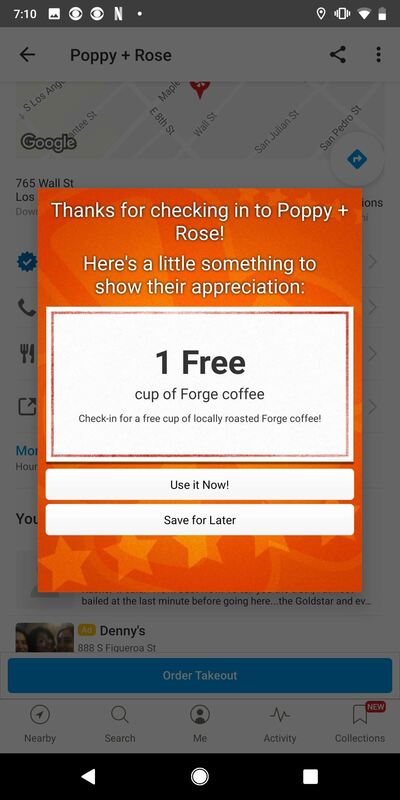 As soon as you hit the "Check In" button, the reward will appear as a pop-up, which you can use right away ("Use it Now") or "Save for Later." If you decide to save the check-in offer for later, there's an easy way to access it. 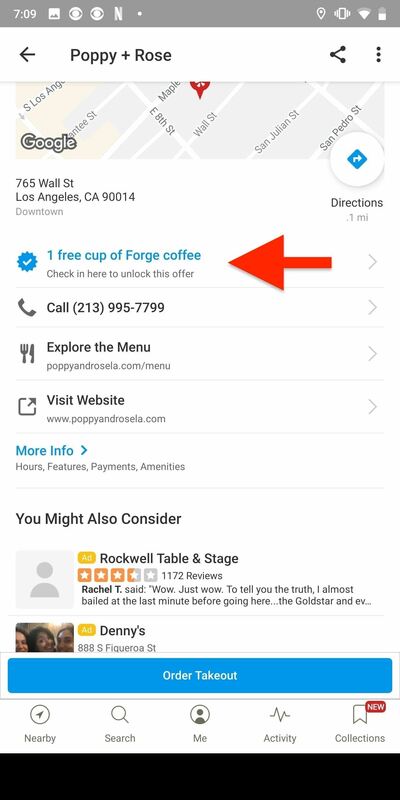 First, you can just go back to the business listing, and the check-in offer will still be there, except it will say "Redeem Your Check-In Offer." The second way is a little bit buried, but you can tap on either "Me" (Android) or "More" (iOS). 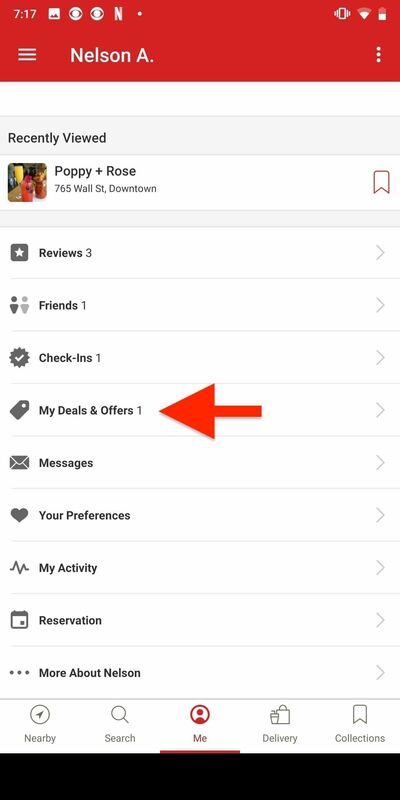 Next, select "My Deals and Offers" (Android) or "Deals and Offers" then "My Deals" (iOS). You'll see your check-in offers available. Tap the one you want, and the deal will pop up to use. There is also another way to go about it. Whether on Android or iOS, tap the "Me" tab, then "Check-Ins." Then, select either "My Check-In Offers" (Android) or "Your Check-In Offers (iOS). Next, just tap on the deal you want to bring up the pop-up. 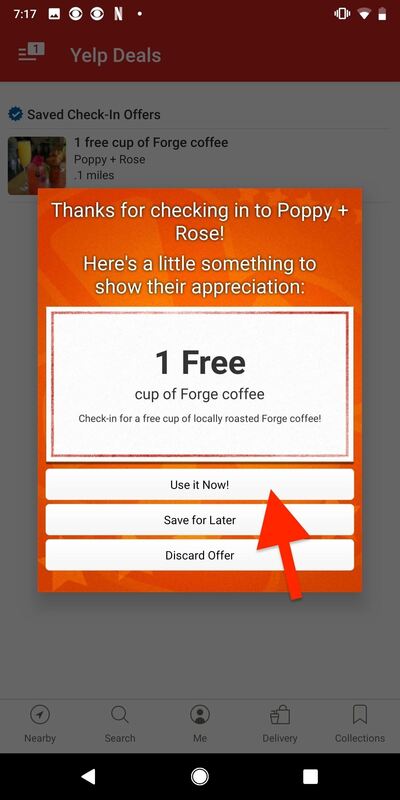 Once you're ready to redeem the offer, tap on it to bring up the pop-up, and then tap on "Use it Now." 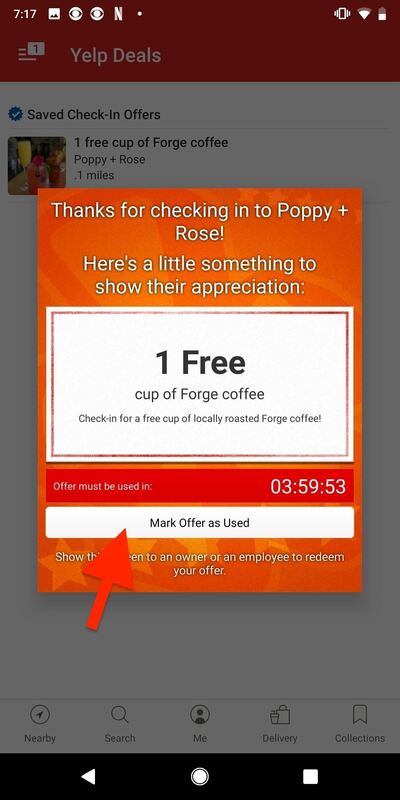 You then have four hours to show your Yelp check-in offer to an owner or employee at the business to redeem the offer. After you redeem it, tap on "Mark Offer as Used" to delete the offer from your account. If you never ended up using the deal, you can select "Discard Offer" to get rid of it as well. Although each business is expected to honor their check-in offers, things change and they may no longer be offering the deal. If your check-in offer isn't accepted, you can contact Yelp's support team. You'll also want to double-check that if you can use it, that they actually apply it, as it's very likely that they may forget. When you check in to a location, whether or not it was because of a check-in deal or not, you'll be one step closer to earning a "Regular At" badge. Once you've checked in a few times, you'll see the badge in your My Achievements section in the "Me" tab. 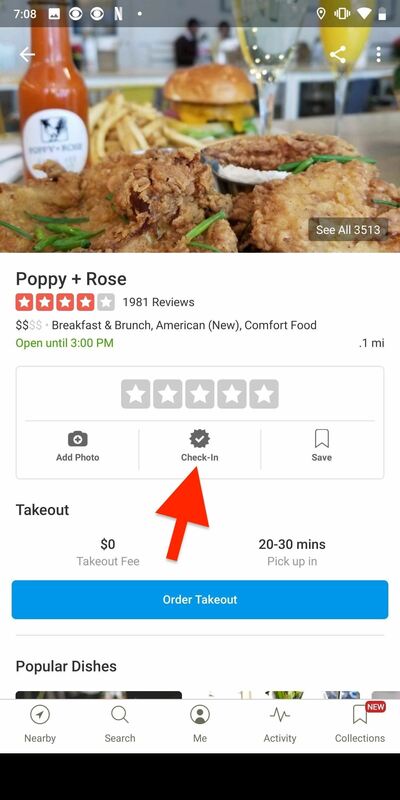 These badges are also visible to others on your public profile (if you shared them to Yelp) and on reviews for the business, if you wrote any. You can also receive "royalty" badges, which are crowns, if you're the person to check-in the most to a business. They're also in your achievements listed as "Dukedom." If you get the most check-ins for businesses in your neighborhood, you get a Baron or Baroness badge. If you've got that in multiple neighborhoods around the city, you could get the King or Queen badge.